The Rubber Flapper Sewage Foot Valve is installed in the vertical position with the direction of flow in upwards. 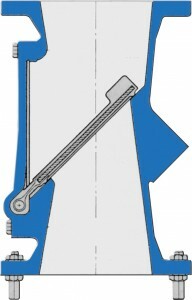 In this position the Foot Valve is normally closed. The Foot Valve opens while the centrifugal pump is running and closes when the pump stops running to maintain a flooded suction and primed pump. The Foot Valve is designed for 175 psi working pressure for water or sewage, it is suitable for submerged service.